Embark on the off the beaten track. 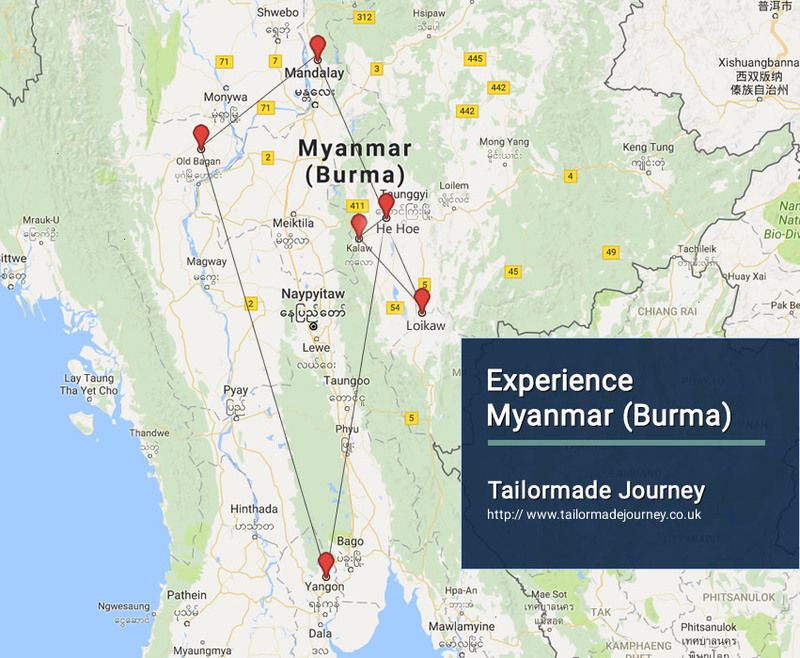 This tour takes one to the main sights plus villages of Myanmar giving opportunities to visit the most interesting ethnic people in Myanmar. Arrive Yangon 1 Night > Flight Heho > Drive Inle Lake 2 Nights > Drive Loikaw 2 Nights > Drive Kalaw 1 Night > Drive Pindaya 1 Night > Drive Heho > Flight Mandalay 3 Nights > Boat Bagan 3 Nights > Flight Yangon 1 Night & Leave. Early morning, start your trip to Loikaw passing along the Inle Lake by boat. Visit Samgar village on the way. Then continue to Phaekhon village (24 mile trip by car about 2 hrs drive). Then transfer to car and continue drive to Loikaw. If the road condition is too bad for driving the car, you have to walk a few minutes to reach your stop. Overnight Stay at the Hotel in Loikaw. Whole day sightseeing Loikaw including the village of the most interesting ethnic people in Myanmar, long nacked Padaung and their traditional weaving villages, Thirimingalar Karen Museum, Taungkwe Zedi, etc. Visit Pindaya Lake, Pindaya Caves and Shan Umbrella making home industry. After early breakfast, transfer to boat jetty. Mandalay – Mingun by boat across the Ayeyarwaddy River. Visit to Myatheindan Pagoda, Mingun Bell, Mingun Pagoda and Village. Return to Mandalay. Sightseeing Mandalay: Mahamuni Image, Wood carving, Gold leaf making and Tapestry Workshop, Shwenandaw Monastery, Kuthodaw Pagoda and sunset from Mandalay Hill. After breakfast, excursion to Amarapura and Sagaing: visit Bagaya monastery; famous for collection of Buddha statues, MahaGandayon Buddhist Monastery, to observe the way of life at monastery, Silk weaving, Ava Bridge and Sagaing Hills; a place for Buddhist devotees and sunset from U-Bein wooden bridge. Visit the ancient capital of ‘Bagan’ and its architecture from 10 -13century AD. When you talk about Bagan, it is needless to say about Buddhism that flourished together with Bagan culture. Sightseeing in Bagan includes Nyaung Oo Market, Shwezigon Pagoda, Gubyaukgyi Temple, Htilominlo Temple, Archaeological Museum, Ananda Temple, Lacquerware Factory, Pyat-tadagyi Temple for panoramic view of the city. Drive to Mt. Popa; 1hr drive from Bagan rises 4981 feet above sea level. It is said to be the centre of the Nats ( Mystical Spiritual Beings ) worshippers and a core of an extinct volcano or the “Oasis” of the dry zone. Visit tower like volcanic plug that houses a picturesque complex of monasteries and Nat shrines which can be reached by winding up 777 steps. Back to Bagan. Afternoon ( around 14:30hrs ) take a boat to Kyauk-Ku Umin . Walk along the small path through mountain to the meditation cave made of sand stone in the 12 century. Visit around to see the stone-relief, stucco of the temple and return back to Bagan at sunset. Today you are transferred to Yangon Airport to board flight for Onward Journey . Hotel Loikaw offers a wide range of stylish designed rooms which are fully equipped with modern facilities and amenities. Each of the 25 rooms consisting of 13 Superior rooms and 12 Deluxe rooms is tastefully designed and furnished to the highest standard of comfort. All the rooms are also provided with split unit air conditioning, hot and cold shower, coffee making facilities, ASTRO (Satellite TV) channels, IDD, Wi-Fi and hair dryer on request. Inter-connecting rooms are also available. They are thoughtfully designed with access of disabled individuals as well.